Real "downhome" taste and a rich brown color make this gravy a customer favorite. This product can accompany your favorite meat, poultry and side dish. Wheat flour, modified corn starch, whey (milk), salt, hydrolyzed corn protein, dehydrated beef stock, monosodium glutamate, autolyzed yeast extract, beef fat, onion powder, caramel color, paprika, maltodextrin (potato, corn), garlic powder, disodium guanylate, disodium inosinate, spices, soybean oil, natural and artificial flavor, beef extract, autolyzed yeast, bha and propyl gallate (used to protect quality). 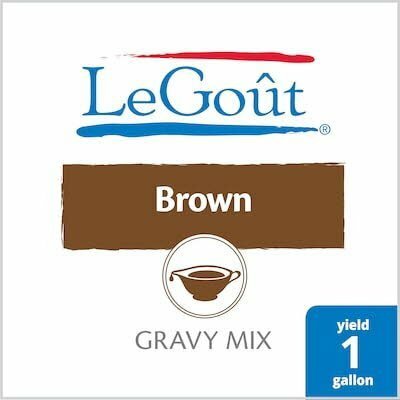 Real "down-home" taste and a rich brown color make this gravy a customer favorite.